The world’s only nuclear-powered container ship “Sevmorput” is getting ready to transport building materials to Russia’s new military base on Kotelny Island. “Sevmorput” is now being loaded with cargo at Murmansk port, and will be ready to leave for the Arctic on May 5, TASS reports. It will be the ship’s first journey along the Northern Sea Route in ten years. The vessel will sail to the island of Kotelny on the New Siberian Islands, where Russia is re-establishing a Soviet-era military base. “Sevmorput” will be carrying building materials, cables, cargo containers, concrete products and lumber, Murmansk port writes on its website. 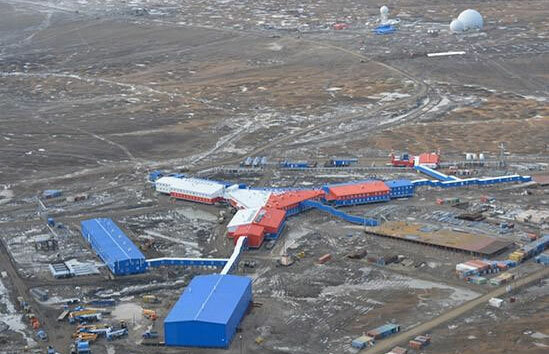 ”Sevmorput” could get a key role in the transportation of troops and military personnel to Russia’s new and upgraded Arctic bases. The ship will also be used for transportation of goods to the new Pavlovsk lead and zink mine in Novaya Zemlya, as well as for assignments for the Russian Arctic oil industry. The journey to Kotelny is expected to take 7-8 days. In the month of May the ice situation on the route can be difficult, so although “Sevmorput” has icebreaking capacity, it will be escorted by the nuclear-powered icebreaker “Yamal”. The 260 meter long and 61.000 ton deadweight “Sevmorput” was built in 1988. In 1992-2006 she was used for transportation to ports along the Northern Sea Route. Later she was docked at the Atomflot base in Murmansk for years without assignments, and Rosatom was preparing to turn the ship into scrap metal. In 2013 it was announced that “Sevmorput” would be renovated and put into service again. Since December 2015, the ship has been going through sailing tests in the Barents Sea. The vessel, originally built at the Zaliv yard in Kerch, Ukraine, was a unique contribution to the Soviet fleet of civilian nuclear vessels when entering service in 1988. Until then, the world had seen only three other nuclear powered civilian merchant ships, all of which ended up as failed experimental vessels.